Our product range includes a wide range of spindle moulder machine. 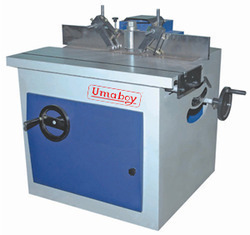 Our organization has gained recognition as a renowned organization for offering high quality Spindle Moulder Machine. The machine offered by us is used to shape the wooden piece according to the desired article in quickest and accurate manner. Driven by a highly efficient electric motor, this vertical oriented spindle machine can be spun at high rotating capacity. Moreover, this machine is acknowledged in the market for its reliable performance. Looking for “Spindle Moulder Machine”?